Fab Foods- We Tried. We Tested. We Liked. My husband, David, and I are on the receiving end of food and drink products occasionally. I am always looking for those that are healthy or have an interested back story. Starting this month, I am adding a once-a month roundup of what we’ve tried, liked and recommend. A Non-Dairy Treat: My/Mo Mochi Cashew Cream Frozen Dessert. Mochi is an Asian frozen treat consisting of sticky sweet rice dough wrapped around a filling, more like a glutinous frozen bon bon. 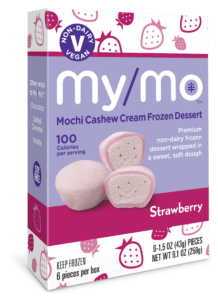 My/Mo is a non-dairy vegan mochi whose filling is made with frozen cashew cream. It is gluten-free and kosher. One pop-in-your-mouth mochi ball is 100 calories and 14 grams of sugar (so eat just one for your treat). I was partial to strawberry. There is also vanilla, chocolate and salted caramel. Note, there is a dairy version, also. 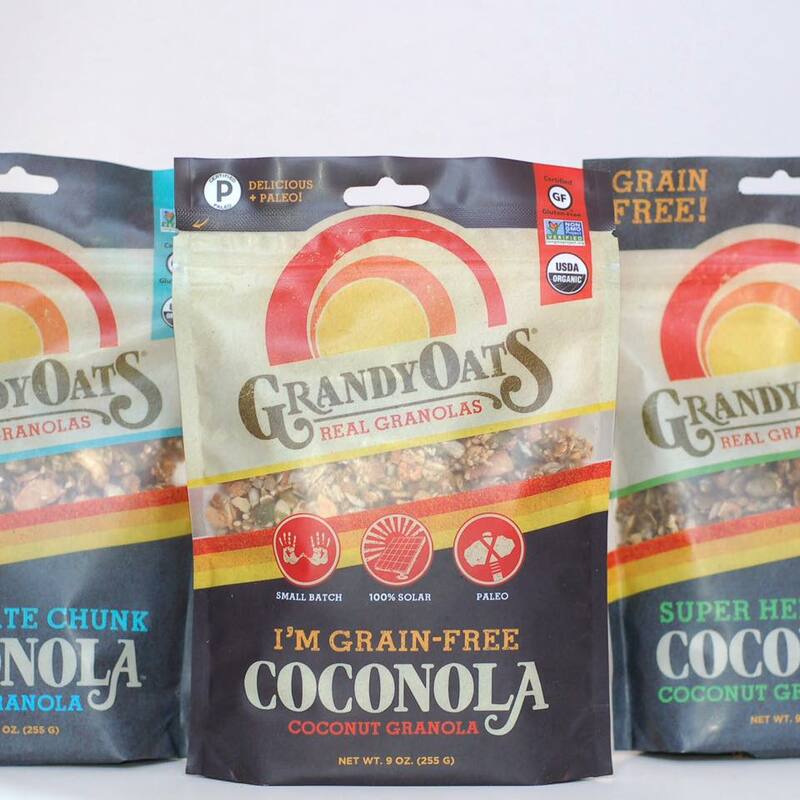 We both liked GrandyOats “Coconola,” all-natural toasted coconut-based, grain-free granola made in Maine with all-natural ingredients and using solar power. The founders are Aaron Anker and Nat Peirce who met in college in New Hampshire, share a love for VW buses, and decided to ditch the corporate life after graduation. We tried a few variations and liked all of them, but Original Coconola and Chocolate Chunk Coconola were my favorites. Certified-organic, certified gluten-free, non-GMO verified and kosher. 150 calories per serving (1/4 cup). Be careful. You’ll want more! I am always look for alternative ways to add a touch of sweetness to my morning yogurt or add flavor to my plain water without added sugar. Believe it or not, I turn to aged balsamic vinegar which can taste slightly and sweetly oxidized. You must try fresh strawberries drizzled with aged balsamic vinegar! I add a little balsamic vinegar when I saute cherry tomatoes and spinach or when I’m roasting Brussels sprouts. I also like to mix balsamic vinegar into my overnight oats and add a dollop of plain Greek yogurt, granola or nuts and dried fruit. We’ve discovered many uses for Olitalia fruit-enhanced aged balsamic vinegar from Modena (home to the best balsamic vinegars in Italy). Olitalia bills itself as a “drinking vinegar,” an alternative to adding apple cider vinegar to your water in the morning, or in a mocktail. It offers the same probiotic benefits for digestive aid and it is a good source of potassium, calcium, vitamins B2 and B3, and rich in biophenols and natural antioxidants. We add a tablespoon of Olitalia to our drinking water, but we really love it in our Greek yogurt! 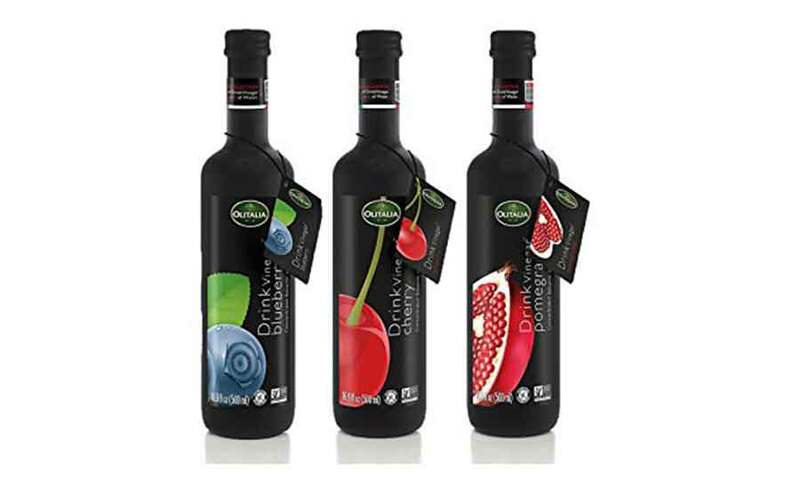 Olitalia drinking vinegar comes in three flavors: blueberry, cherry and pomegranate. We tried and recommend cherry. This is not a paid sponsored post. From time to time David and I receive free products to try. We don’t guarantee coverage and choose to write about what we like. We do include affiliate links to Amazon and make a very small amount of money if you decide to buy the products through the links. I also write, on occasion, sponsored posts and will always disclose this when I do.